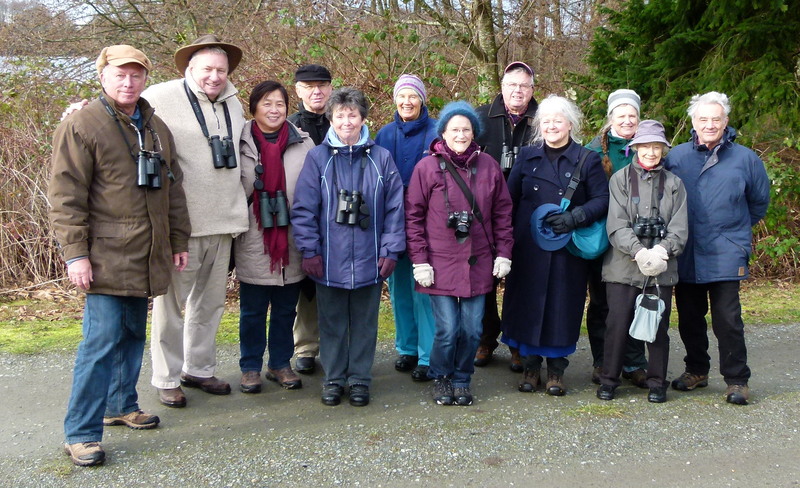 Twelve DNCBer’s (Roger, Lorna, Susan, Mike, Gerhard, Eleanor, Sheila, Marion, Marti, Hans-Ulf, Donna and me) enjoyed a cool Monday morning of birding at the Tsawwassen Ferry Terminal, through the Ladner farm fields, and then at Alaksen National Wildlife Area (NWA). Hi-lites were: several Yellow-rumped Warblers, Northern Shrikes, lots of Waterfowl in breeding plumage and other good stuff. Check out Roger’s and Marion’s photos on our DNCB Picasa website. Eleven birders left Petra’s at 8:00 a.m. and stopped along the Tsawwassen Ferry Terminal causeway, then at the terminal. (One birder was late because he slept in after a “wet and boisterous” Super Bowl party on Sunday). 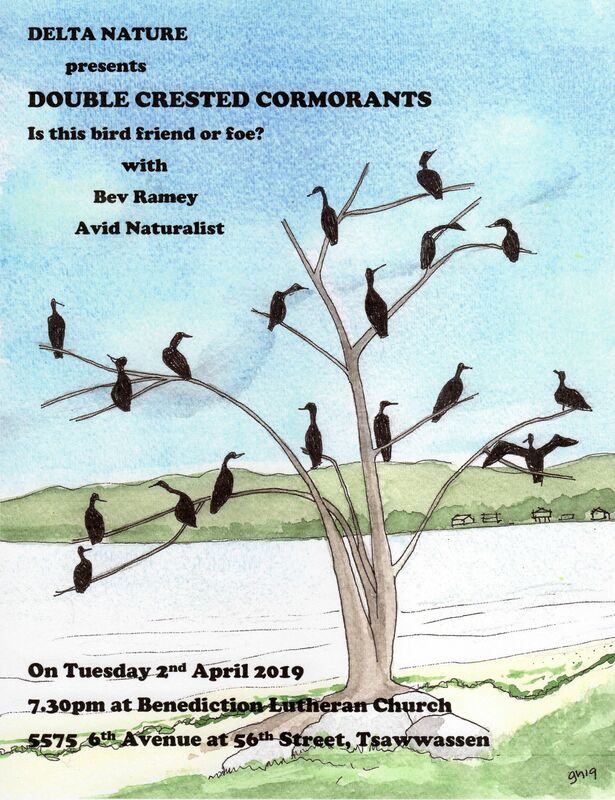 The resident Black Oystercatchers were seen as were Common and Barrow’s Goldeneye, Red-breasted Mergansers, Common Loons and lots of Double-crested Cormorants. At the Kingfisher Bridge on Tsawwassen First Nations land, as usual, there was no Kingfisher. Lots of Great Blue Herons, Bald Eagles and a few Northern Harriers around. The drive through the Ladner fields was quiet until we stopped on 33A Avenue. While watching a flock of Trumpeter Swans, we noticed a flock of Dunlin feeding and swarming around them. There were Black-bellied Plovers among them and Marion saw a Peregrine Falcon fly past. 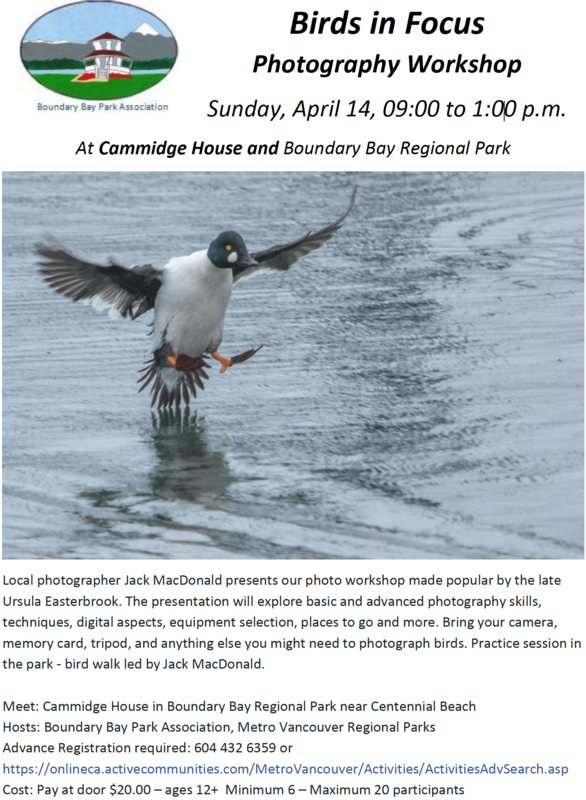 At the Canoe Pass Lookout onto the south arm of the Fraser, we saw lots of Goldeneye, several Western Grebes, a Horned Grebe, Double-crested Cormorants and a couple of Loons which we think were Red-throated. Roger and a crew checked out, in vain, the conifer trees across the road to see if Kay’s Barn Owl was around. We moved on to Alaksen NWA and searched for the resident Barred Owls along the entrance driveway. We found lots of Pellets, but no owls. No Bird Studies Canada (BSC) Staff were in their offices, but we learned that this is Peter Davidson’s last week before he and his family move to Africa. Walking the trail, we had some neat sightings in the main pond before the barns. A flock of beautiful Hooded Mergansers, up-close-and-personal, with a Common Merganser, Bufflehead, Cormorants, American Wigeon and Mallards around too, and later a couple of Pied-billed Grebes and an unseen Belted Kingfisher were here. The trail around the “island” was quiet, except for the inane chatter about the huge list of birds we are not seeing; it’s too cold; I’m hungry; where is a nice place to lie down; etc. etc. 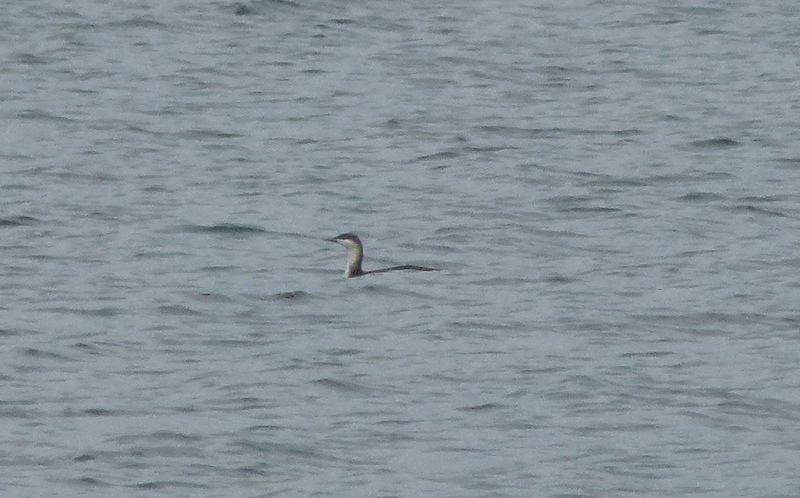 Along the river, we saw several Loons, with more discussion as to whether they were Red-throated, Pacific or Common. Gerhard found his bed and saw a boat on the river that excited him. On the inland trail, several Golden-crowned Kinglets and a couple of Brown Creepers caught our attention. Marti spotted a flock of shorebirds which “grew” into a beautiful V of Snow Geese. After being accosted by Roger, then PB Lorna, visiting birder Andy (aka Lens) took our obligatory Group Photo. We then wandered around the old Reifel mansion (now Environment Canada offices) and the new almost-finished building. Mike spotted a Northern Shrike perched in the same tree behind the offices where we often see good stuff. 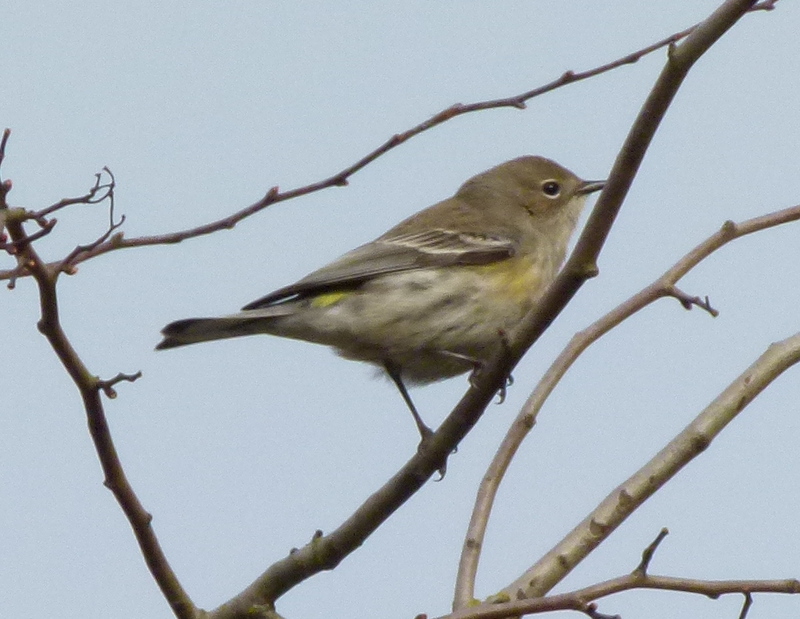 Then Marion spotted a flock of Yellow-rumped Warblers flitting in a bush for good looks by all, including Binless Susan. A Gadwall was in the adjacent pond. While in the parking lot, enjoying Lorna’s PB Sandwich, and drooling on Marion’s cheese and crackers which she refused to share, another Northern Shrike posed on top of a conifer. Before leaving Alaksen just after Noon, Susan, Hans, Mike and I toured the CWS offices. Another fun morning with the DNCB “Characters”. I will be visiting friends and relatives in Ontario (Niagara Falls, Kingston, Brampton and the Muskoka’s) next week, so Roger and PB Lorna will lead the group from Petra’s at 8:00 a.m. on Monday, Feb. 11. It will be a local outing “somewhere around the Bay”. 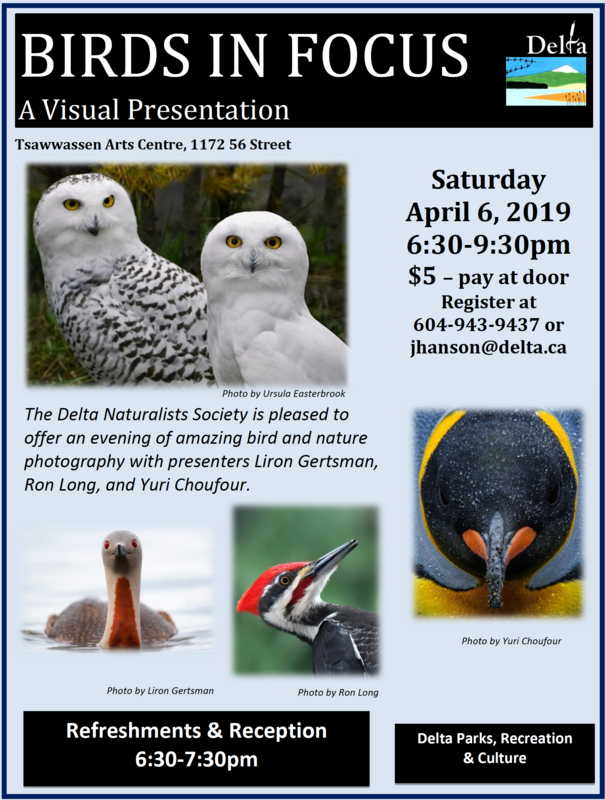 This entry was posted in *DNCB, Alaksen NWA, Bald Eagle, DeltaPort Causeway, Peregrine Falcon, TFN, Tsawwassen Ferry Port, Westham Island. Bookmark the permalink.